The uprising began in the city of Wuchang in 1911 and triggered the Xinhai Revolution leading to the end of the Qing Dynasty and two millennia of dynasty rule in China. On January 1, 1912 the Republic of China was established, but after the end of World War II the Communists took control over the mainland China and the Government of the ROC had to relocate to Taiwan. Celebration of National Day begins with the ceremony of raising the flag of the ROC in front of the Presidential Building. Public sings national anthem, sometimes the official celebration is followed by a military parade. After the official part traditional festive events representing Taiwanese and Chinese culture take place on the streets of Taiwan. Before the firework display President of Taiwan addresses the nation. The scale of celebration of this holiday varies from year to year, that depends on political and social situation in Taiwan. For instance, all government sponsored festivities were canceled in 2009 and the money were relocated for reconstruction of the damage done by Typhoon Morakot. 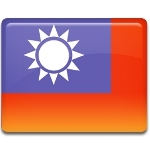 National Day is celebrated only in Taiwan, the mainland China doesn't recognize this holiday. National Day had also been a public holiday in Hong Kong till the United Kingdom broke the relations with Taiwan. Nowadays its an unofficial holiday in Hong Kong.